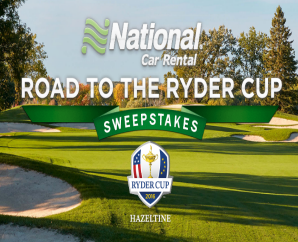 National Car Rental “Road to the Ryder Cup” Sweepstakes & IWG – Win a trip to the 2016 Ryder Cup & more! Win a trip to Minneapolis for the 2016 Ryder Cup & more! ENTER SWEEPSTAKES HERE – National Car Rental Sweepstakes page. ELIGIBILITY – The National Car Rental Ryder Cup Sweepstakes & Instant Win is open only to legal residents of the fifty (50) United States (and the District of Columbia) who are at least 21 years old at the time of entry. SWEEPSTAKES ENTRY PERIOD – The Promotion begins on June 13, 2016 at 12:00 a.m. Eastern Time (“ET”) and ends on July 24, 2016 at 11:59 p.m. ET. ONE (1) GRAND PRIZE: A trip for two (2) to Minneapolis, MN for the Ryder Cup 2016. Trip package includes round trip, coach-class air transportation for two (2) from a major airport near winner’s home (determined by Sponsor in its sole discretion) to Minneapolis, MN; four (4) nights’ accommodations at a hotel determined by Sponsor in its sole discretion (single room, double occupancy); two (2) tickets to each day of the Event (September 29 through October 2); one (1) parking pass for each day of the Event; Ryder cup apparel for winner and guest; $1,000 spending money; and travel agent services. Winner and guest must travel on same itinerary. Approximate Retail Value (“ARV”): $9,400. FOUR HUNDRED TWENTY (420) FOURTH PRIZES: Twelve (12) Srixon Z golf balls. ARV: $40.